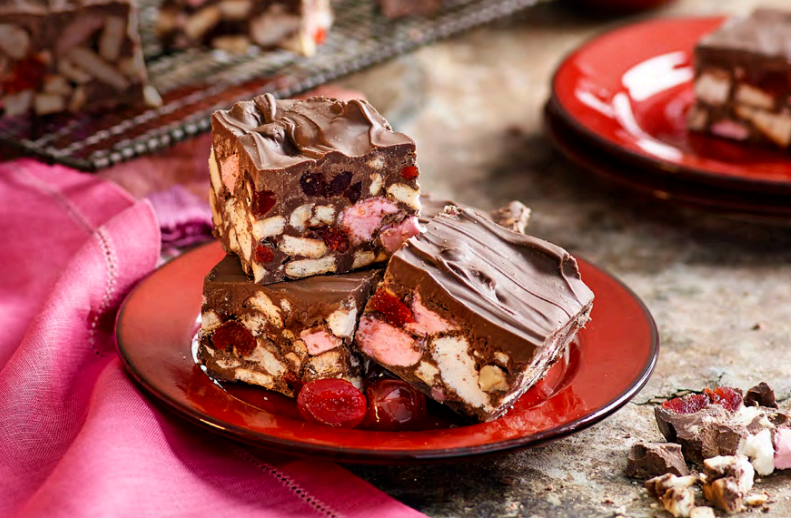 This is the only Rocky Road recipe you’ll ever need. Perfect for Australia Day… be the hero AFTER the barbecue . And it keeps great in the fridge and can be made well in advance. Enjoy! 1. Grease a 25 x 16cm slice tin with butter and line with baking paper. Roughly chop biscuits and put in a large bowl. 2. Using wet scissors, snip marshmallows in half. Add to biscuit with cherries and hazelnuts, and stir until well combined. 3. Put 500g of the chocolate in a heatproof bowl and set over a saucepan of simmering water. Cook, stirring occasionally, until chocolate is melted and smooth. Remove from heat and set aside to cool for 5 minutes. 4. Pour chocolate over biscuit mixture and, working quickly, stir until well combined. 5. Transfer mixture to prepared tin and spread out evenly over base using a spoon. 6. Put remaining chocolate in a heatproof bowl and set over a saucepan of simmering water. Cook, stirring occasionally, until chocolate is melted and smooth. Spoon onto slice and use a spatula or spoon to spread out evenly. Put slice in fridge for 1 hour, or until set. When firm, cut into 20 squares to serve.